NextInterview with Dylan Ollivierre from The Money War. The Our Lady of Vladimir (Theotokos of Vladimir) is a medieval Byzantine icon of the Virgin Mary and Child. It is believed that the Icon was painted in Constantinople, some time during the beginning of the twelfth century, and was sent to the Grand Duke of Kiev as a gift. Soon after the Grand Duke’s death, his son Andrey Bogolyubsky plundered the Theotokos (and many other religious treasures) for arguably his own selfish reasons. Legend has it that along its journey to its new home, the horses transporting the precious icon stopped near Vladimir and refused to move. So it seemed, with the Theotokos left stranded, Bogolyubsky had no choice but to build a magnificent new church (Assumption Cathedral) in Vladimir to safely house the icon. However by 1395, the icon was later taken to Moscow, to protect it from invaders from the east. Today, she is regarded as the face of Russian Orthodoxy and often referred to as the protectress of Russia. On a personal note, the twelfth century tempera and wooden panel icon (measuring 69cm x 104cm) is one of my favourite religious icons. It represents to me all that is beautiful about Byzantine art. There is also I believe a certain otherworldly charm about its worse for wear appearance that indicates how much it was once loved or venerated over the centuries. With its colourful history and its reputed powers of protection, it’s easy to imagine that the icon was likely dragged around or put on show for most of its existence. Its present condition would likely testify to that. I’m surprised it hasn’t fallen further into disrepair despite attempts to repaint it over time. For instance the traditional inscriptions indicating the Virgin Mary and Christ are barely visible. The gold leaf background is also almost completely worn away. Moreover, the simple human handling of this icon has also chipped away or eroded the left hand and right foot of the Virgin and Child. There is no doubt that Christian worshipers would have touched the icon in the ultimate expression of their devotion and love for Mary and Christ. 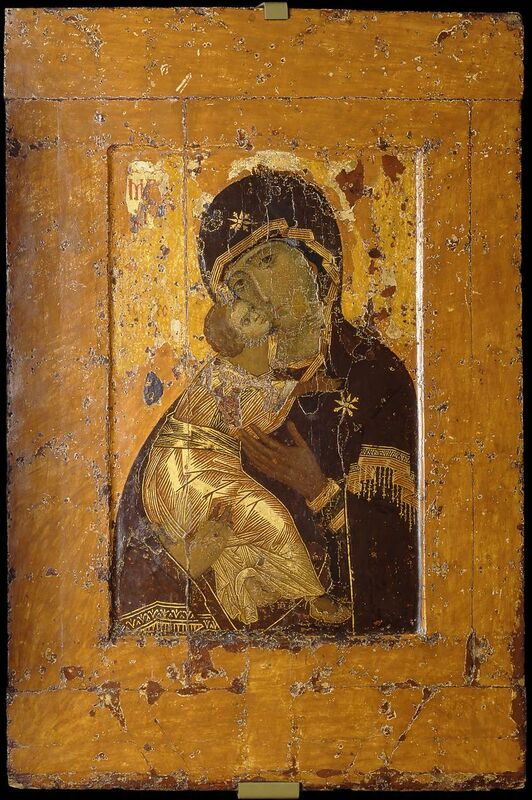 Interestingly though it is believed the faces of the Virgin and Child, including his hand around the Virgin’s neck and his shoulder are the only original elements of the icon to survive. On a final note, if I could add just one last thing about the icon that I adore the most about it, it would be the Virgin’s sorrowful or mournful expression, especially those amazing large eyes. Her long slender nose and even the awkward disproportional appearance of the infant Christ, clutching at his mother is amusingly interesting. Photo credit: The Our Lady of Vladimir is a public domain work of art. The icon itself is currently housed in the Tretyakov Gallery, Moscow, in a functioning church in the grounds of the museum.